These days tassels are everywhere. From party backdrops to jewelry to embellishments. The most popular are the tissue garlands. Although they look so pretty and festive, they are very delicate and get crumpled and ripped very easily after one use. Since I also do party backdrops, I wanted to come up with a sturdier version which I could store easily and reuse over and over again. I decided to use felt instead of tissue and simply loved the result! 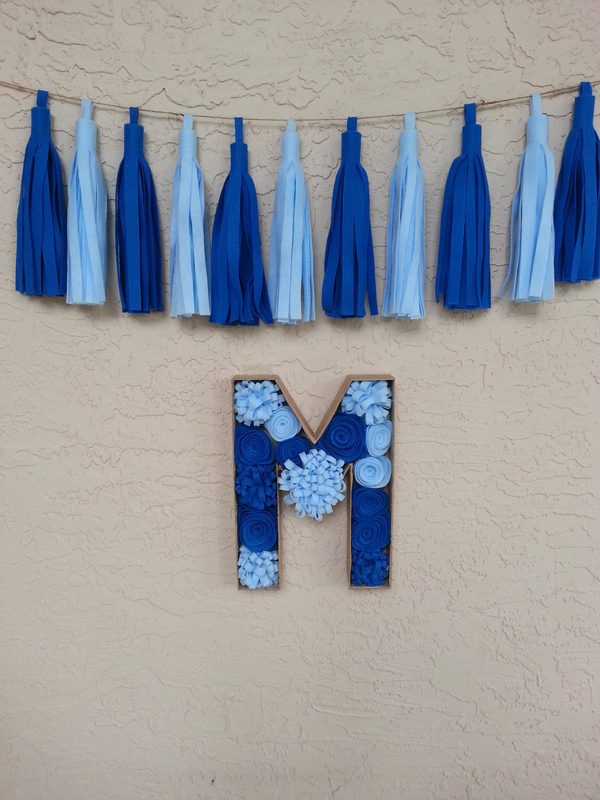 You don’t have to be crafty to make this tassel garland. Try it at your next party as a backdrop for your photos or dessert table. For the felt, I used the pre-cut 9″x 12″ sheets you can find at Walmart or any craft store like Michaels or Joann. You can also purchase felt by the yard, but since there is already a lot of cutting involved in this project, I decided to skip a step. Cut quarter inch strips from each sheet of felt, leaving a 2 inch border at the top as shown. Decide how many tassels you want to make and cut all of them before going to the next step. Don’t worry if the fringe is not cut straight. Once the tassel is complete it won’t be noticeable. Now cut a quarter inch wide and 4″ long strip of felt . Fold in half and glue the ends to make a loop. Place it down on one end of the felt and secure it with glue. Roll the tassel tightly and glue once you come to the other end. Your tassel is now complete! Continue making the rest of the tassels. Thread twine or ribbon through each loop to complete your garland. Although this project is a little time consuming, it’s very simple to make. Use it at your next party to wow your guests! They make any occasion a bit more festive, so do try it!